A Stage of completion for the first part of a project. Possibility of import/export. Opportunity comes through setting a new life course, and your business can prosper if you remain positive and focussed and willing to put in the hours. You may gain assistance in the form of knowledge who can give you more information. Cooperation is recommended, as you may need to have more than one outlet to assist you with your endeavours. This card can also indicate a business venture that includes import/export, or work related international travel. 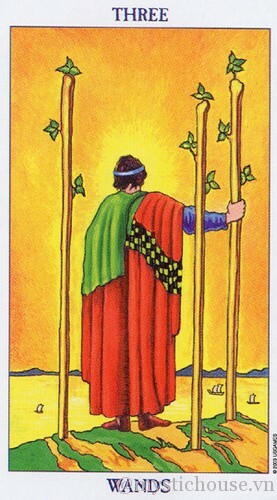 When this card is reversed it appears that the opportunities have become scarce and that activity has decreased. Work opportunities are in short supply, and it is difficult to find employment. You may also be holding yourself back and not looking at the bigger picture or opportunities further afield and refusing to take the necessary steps and actions required securing your vision and manifesting it. It can also indicate false starts to business, and delays in new ventures. Your skills and talents are being wasted and it is now time to find a new path. If you have been worried about the health of someone – time to be calm, as your calm demeanour will be more helpful to them. Your life path may have decided for you over the last months that a new course is necessary and you have actively commenced creating change in your life. This could be in the form of a new business or fresh start within business. You have been prepared to put in the hours to reach your goals. You may even have been working irregular hours with counterparts overseas There has been a new direction in life - most likely related to business. You may also have been exploring options overseas with a view to import/exporting. There have been more than one positive options but you have been considering your options perhaps those that you see are not totally satisfactory to you in your vision of how you see the future, and so you have been "expanding your vision and awareness to see what else is available or may present in the near future". One of the options looks to have been a good solid back up option. You appear to be exploring your options - most likely within your career/work sphere. There appears to have been a number of options presented but you will decline at least two of them and the other one is somewhat satisfactory but not necessarily "perfect" in your minds eye. You will hold onto it as a "back up option" until you have further explored what is available and determined if there will be anything better suited to your tastes. Options you are exploring appear to be might include business with overseas counter parts, or import /export. Overseas trading. These options look positive in relation to establishing the financial and material security you desire. You may want to ask more questions and ensure that they are clear, with clear answers before committing yourself further. You are in the process of actively implementing change in your life. You have reflected on opportunities and options available to you and are now in the process of removing the obstacles and putting in the hours to make your dream and vision a reality. . Your life path suggests that a new course is necessary that the time has arrived to actively commence creating change in your life. This could be in the form of a new business or fresh start within business. You will be required to work long and possibly irregular hours, however you also know that the hard work will pay off eventually. There is a possibility of an overseas work connection. Strength or Justice (combined with) - eventually your efforts will pay off. Keep going and stay focussed. High Priestess- this is a good time to study spiritual and develop your awareness. Look at getting some self development books to help heighten your intuitive abilities. Wheel of Fortune - Maintain a positive attitude, and success is assured especially if the Wheel is upright.